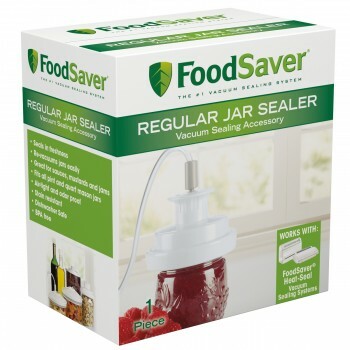 Don't just close those Mason-type jars, make them air-tight with help from this regular-mouth jar sealer from the experts at the FoodSaver brand. The handy one-piece attachment fits on pint- and quart-size,regular -mouth, Ball and Kerr Mason jars to create an effective vacuum seal that locks out air, sealing freshness in. Re-seal those handy food-storage jars again and again, using a standard Mason jar lid and the FoodSaver jar sealer. Though not to be used as a replacement for traditional canning methods, the FoodSaver wide-mouth jar sealer works well for safely storing strawberry and blackberry jams, chocolate sauces, hot mustards, and other liquids and fragile foods. It's equally effective for storing dry foods like brown sugar, aromatic spices, dried fruit, and baking flour. The FoodSaver jar sealer keeps food fresh up to five times longer when compared to other storage methods (like zipper bags, foil, plastic wrap and plastic containers). The FoodSaver system can also help you save up to $2700 a year by buying food in bulk, purchasing on-sale food items, and not having to worry about freezer burn or wasted food. The jar sealer ensures convenient, reliable performance from one use to the next. Made with BPA-free plastic, the wide-mouth jar sealer is odor-proof, stain-resistant, and easy to clean by hand or in the dishwasher. The FoodSaver brand provides a range of vacuum sealing systems and an array of useful accessories like containers, jar sealers, and wine-bottle stoppers as well as pre-cut freezer bags and rolls of bag material for creating custom-size bags. An effective and convenient food-storage solution. The FoodSaver brand not only helps people save time, money, and food, but it also helps keep kitchens running smoothly and efficiently--perfect for busy families or for those who love to entertain.